If your clients get called for jury duty, they should make sure it isn’t fake. Jury duty scams can take many forms. 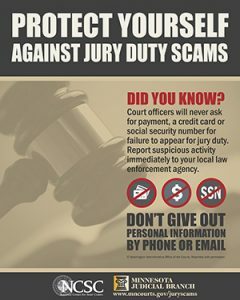 Recent scammers have used fraudulent phone calls and e-mails threatening a citizen with fines, prosecution, or imprisonment for failure to comply with jury service in federal or state courts. The scammers demand a citizen to provide payment or to divulge private information that the scammer can use for identity theft purposes. Gildea said that initial contact about jury duty will always be made by U.S. Mail in the form of a juror summons from a Minnesota district court. Minnesota courts will never contact a person by phone or e-mail and seek payment of fines, Social Security numbers, credit card information, or any other sensitive information in response to missed jury duty. Any person receiving a suspicious call or e-mail seeking financial or private data related to missed jury duty is urged to contact their local county sheriff’s office. Any person with questions about their jury duty should contact their local district court. Contact information can be found at www.mncourts.gov/jury by clicking on the “County Jury Info” tab.